William F. Albright, "An Aramaean Magical Text in Hebrew from the Seventh Century," Bulletin of the American Schools of Oriental Research, 76, 1939, 5-11. Brandt Aymar, ed., Treasury of Snake Lore From the Garden of Eden to Snakes of Today in Mythology, Fable, Stories, Essays, Poetry, Drama, Religion, and Personal Adventures, New York: Greenberg, 1956. Anne Baring and Jules Cashford, The Myth of the Goddess: Evolution of an Image, London: Penguin, 1993. Athalya Brenner, ed., A Feminist Companion to Genesis, Sheffield, England: Sheffield Academic Press, 1993. Peter Brown, The Body and Society: Men, Women, and Sexual Renunciation in Early Christianity, New York: Columbia University Press, 1988. E. A. Wallis Budge, Amulets and Talismans, New Hyde Park, NY: University Books, 1968. Joseph Campbell, The Mythic Image, Princeton: Princeton University Press, 1974. Elizabeth A. Clark, Women in the Early Church, Wilmington, Del. : Michael Glazier, 1983. Gillian Clark, Women in the Ancient World, Oxford: Oxford University Press, 1989. Frank Moore Cross, Canaanite Myth and Hebrew Epic: Essays in the History of the Religion of Israel, Cambridge, MA: Harvard University Press, 1973. Joseph Dan, "Samael, Lilith, and the Concept of Evil in Early Kabbalah," Association for Jewish Studies Review, 5, 1980, 17-40. Joseph Dan, ed., The Early Kabbalah, New York: Paulist Press, 1986. John Day, "Asherah in the Hebrew Bible and Northern Semitic Literature," Journal of Biblical Literature, 105, 1986, 385-408. Riane Eisler, The Chalice and the Blade, San Francisco: Harper, 1987. I. Epstein, The Babylonian Talmud, 16 vols. in 7 parts, London: Socino Press, 1978. Edward S. Gifford, Jr., The Evil Eye: Studies in the Folklore of Vision, New York: Macmillan, 1958. Robert Graves and Raphael Patai, Hebrew Myths: The Book of Genesis, Garden City, NY: Doubleday, 1964. Jean M. Higgins, "The Myth of Eve: The Temptress," Journal of the American Academy of Religion, 44, 1976, 639-647. Knut Holter, "The Serpent in eden as a Symbol of Israel's Political Enemies: A Yahwistic Criticism of the Solomonic Foreign Policy?" Scandinavian Journal of the Old Testament, 1, 1990, 106-112. Flemming Hvidberg, "The Canaanitic Background of Gen. I-III," Vetus Testamentum, 10, 1960, 285-294. Karen Randolph Joines, Serpent Symbolism in the Old Testament: A Linguistic, Archaeological, and Literary Approach, Haddonfield, NJ: Haddonfield House, 1974. Emil Kraeling, "A Unique Babylonian Relief," Bulletin of the American School of Oriental Research, 67, 1937, 16-18. Susan S. Lanser, "(Feminist) Criticism in the Garden: Inferring Genesis 2-3," Semeia, 41, 1988, 67-84. Jean Laporte, The Role of Women in Early Christianity, New York: Edward Mellen Press, 1982. Sarah Roth Lieberman, The Eve Motif in Ancient Near Eastern and Classical Greek Sources, Ph.D. dissertation, Boston University, 1975. Pamela J. Milne, "Eve and Adam: Is a Feminist Reading Possible?," Bible Review, 4, 1988, 12-21, 39. Balaji Mundkur, The Cult of the Serpent: An Interdisciplinary Survey of Its Manifestations and Origins, Albany: State University of New York Press, 1983. 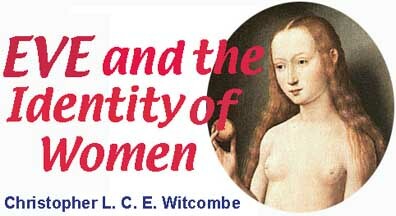 Elaine Pagels, Adam and Eve and the Serpent, London: Weidenfeld and Nicholson, 1988. Raphael Patai, "The Goddess Asherah," Journal of Near Eastern Studies, 24, 1965, 37-52. Raphael Patai, The Hebrew Goddess, Detroit: Wayne State University Press, 1990. Gerhard von Rad, Genesis, A Commentary, translated by J. H. Marks, Philadelphia: Westminster Press, 1961. William L. Reed, The Asherah in the Old Testament, Fort Worth, Texas: Texas Christian University Press, 1949. Russell Hope Robbins, The Encyclopedia of Witchcraft and Demonology, New York: Crown Publishers, 1959. Gershom Scholem, On the Mystical Shape of the Godhead: Basic Concepts in the Kabbalah, New York: Schocken Books, 1991. Joyce E. Salisbury, Church Fathers, Independent Virgins, London and New York: Verso, 1991. Morton Smith, Palestinian Parties and Politics That Shaped the Old Testament, New York and London: Columbia University Press, 1971. H. F. D. Sparks, ed., The Apocryphal Old Testament, Oxford: Clarendon Press, 1984. F. R. Tennant, The Sources of the Doctrine of the Fall and Original Sin, New York: Schocken, 1968 (first published 1903). Phylis Trible, "Depatriarchalizing in Biblical Interpretation," Journal of the American Academy of Religion, 41, 1973, 30-48. Phyllis Trible, God and the Rhetoric of Sexuality, Philadelphia: Fortress Press, 1978.